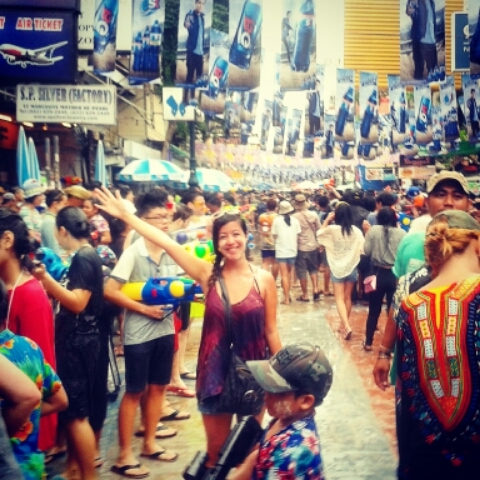 Bangkok, Markets and Songkran Festival – Where's Walton? Our last stop into Bangkok couldn’t be more well timed. 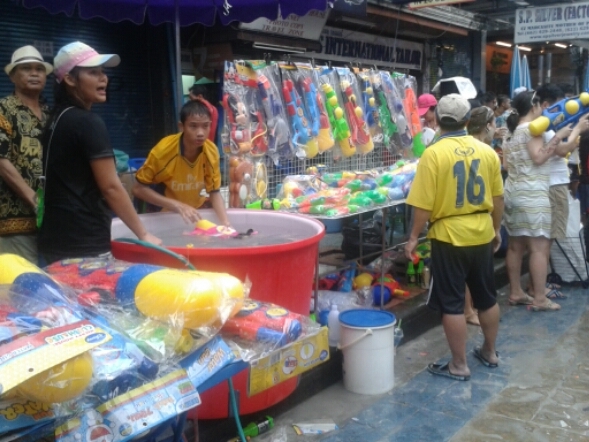 We were in the capital city for the Songkran Festival, Thailand’s New Year 2015. 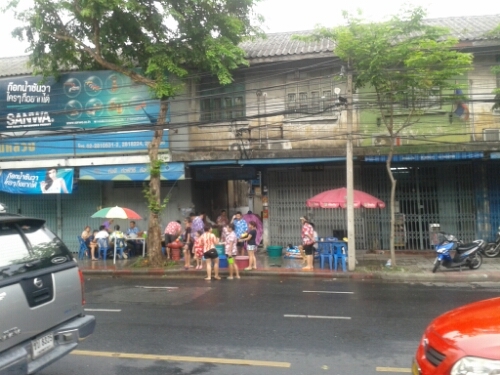 1: Chatuchat Market – The is a weekend only market. When locals recommend it to you, you know it’s going to be good. 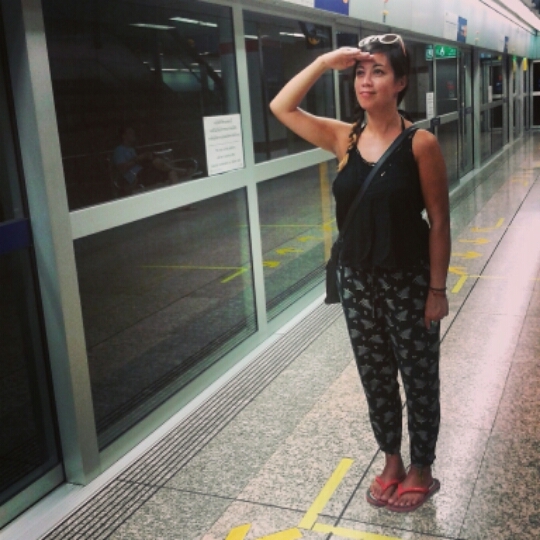 We took the MRT train all the way to Kamphaengpecth Station and the market begins just as soon as you exit the station. 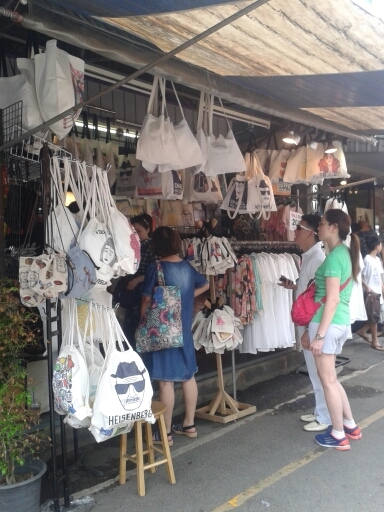 To a Brit, this place can be compared to Camden Market. It sells trendy, unique fashionable clothing items and accessories. 2. MBK Mall – This is a 6 floor mall with general shops as well as markets for souvenirs, bags, electricals, food courts etc. This was a 45 minute walk from our hostel, Loftel22 but after no exercise since New Zealand we were happy to do the trek over and back. 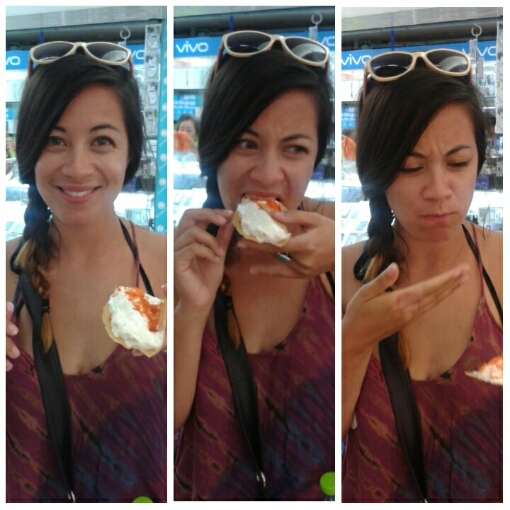 At this mall we kept walking passed these 10baht (20p) pancakes. There were so many people buying these that we had to see what the fuss was about. Excited… Dig in… Oh dear. It’s a hard crunch pancake, a sweet foamy cream and the orange topping was a strange sweet ginger… the only way we could describe the feeling/taste was “uncertainty”. It was sweet but weird! It didn’t quite work for us. Should have got ice cream. After the MBK we got on a free local bus to Khoasan Road. The main backpacker tourist spot. We had been advised that this was a popular place to see the water festival in full swing. 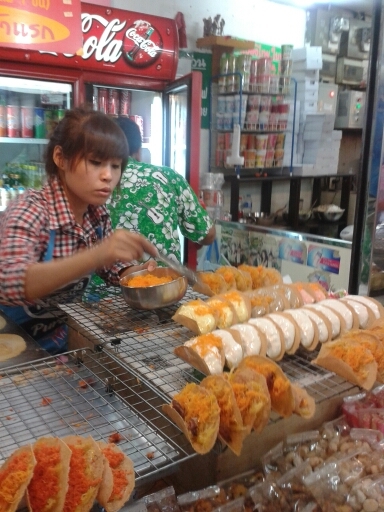 But in fact, in Bangkok the festival was almost everywhere you looked. On the walk down local kids sat in paddling pools or with hose pipes waiting to splash you. 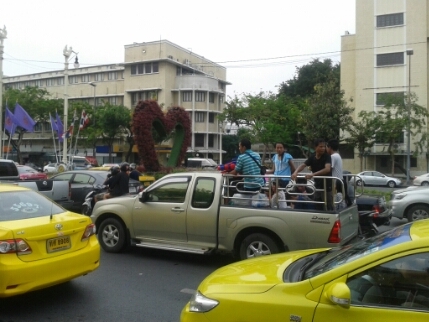 People were driven around on the back on trucks and tuk tuks armed with super soaker water guns squinting anyone in their proximity. No one is safe, if you go out you are a target. Don’t wear anything fancy! 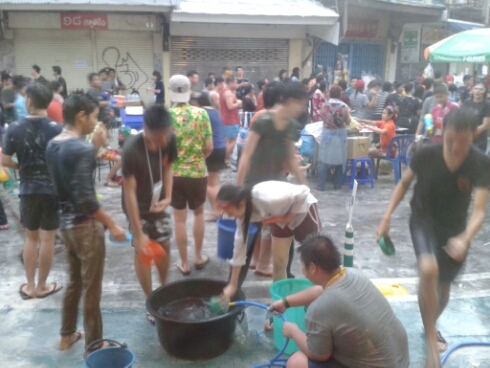 It’s really fun to drive around town and people watch… this water festival had taken over. It was amazing to see how people were really getting involved and from what I could see it was 90% thai locals and 10% tourists. The locals really get involved with this and really get into it! 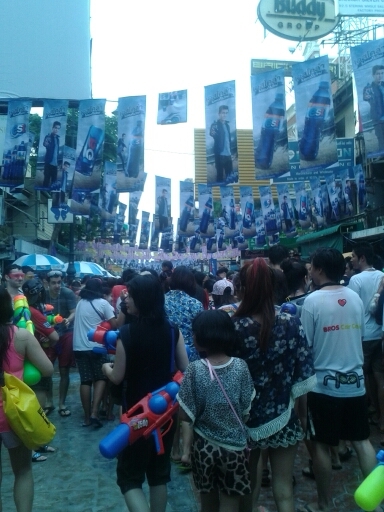 When we arrived near Khoasan the streets were INSANE! There was so many people, all soaking wet and all armed with water. Bekki and I, the simple girls that we are were unarmed. We didn’t even have water bottles. After a half an hour shuffle to move 20 steps we arrived at Khoasan. It was time to really experience this festival! 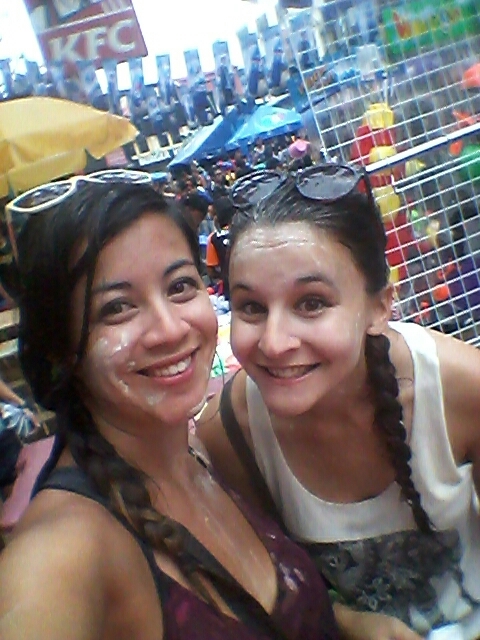 At Songkran festival you can also forget your personal space… people are also armed with flour mixed with water. They will smish it on your hair and face with a big grin of satisfaction. Let it happen. There’s nothing you can do. It’s also so crowded that you can’t run away! Eventually it did get too much and far too crowded, like dangerously crowded . So we took shelter in a near by Vegetarian Restaurant. It is here that we met a British couple who had no idea about the festival. 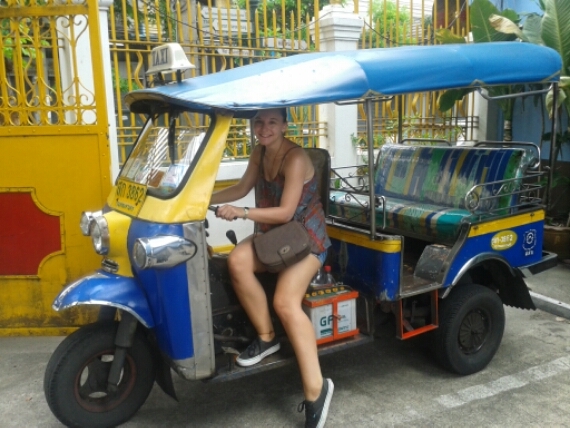 Bekki had discussed this earlier on that day… imagine arriving in Thailand with no idea about Songkran, it would be a shock. Well this couple had 10 hours in Bangkok before a flight back to the UK. No place to shower!!! 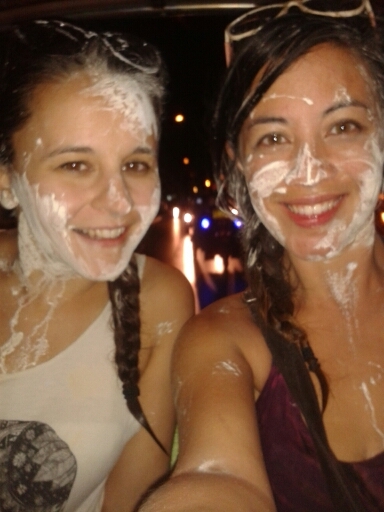 They were really looking forward to showing up to the airport drench and covered in flour. They took it well though. I loved this festival!!! 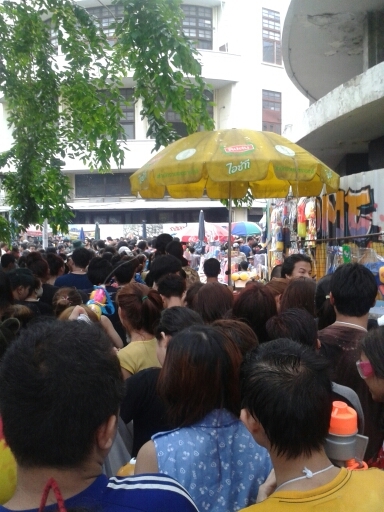 I was outstanded by the amount of local people involved. It was a lot of fun and definitely made you forget about the heat. The next day it was time to go… I was off to the Philippines and Bekki was returning to the UK. 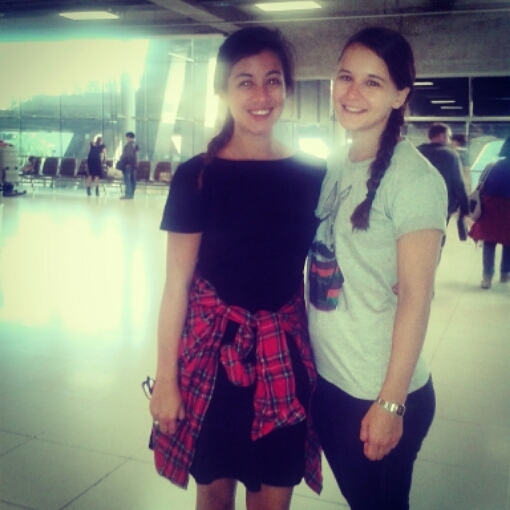 After 3 months together it felt so strange to say goodbye to her, more so than it did leaving last year when I started travelling. As much as I like to be independent I don’t think I could have done or enjoyed Australia, New Zealand, Laos and Thailand without her!! We’ve experienced some amazing places together and I’m sure they’re more travel adventure together to come!